There is no doubt that Injustice Mobile’s lifespan has far exceeded the lifespan of the console version in both developer support and fan interest. The game has far outgrown it’s bigger brother and has become a much more than just the next mobile game. But ever since the announcement of Injustice 2 many fans have been asking what its mobile version will be and how it is going to relate to Injustice Mobile. In this article we are going to give you all the facts and the current status of Injustice 2 Mobile. Injustice Mobile gets updated with the new Injustice 2 characters. Injustice Mobile’s support is stopped and Injustice 2 Mobile is introduced with all new characters. You keep both games and support them until one of them looses the battle. So here is what information we have so far from developer Netherrealm Studios and creative director Ed Boon himself. 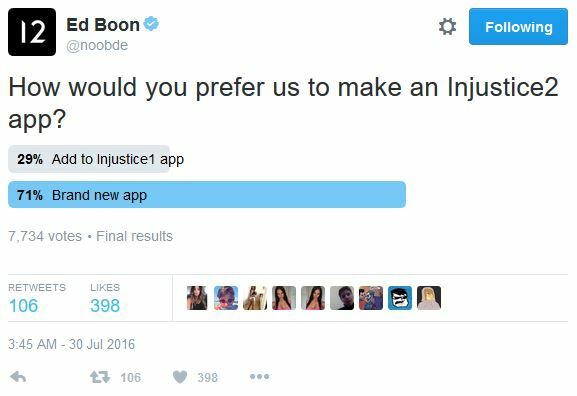 What is you preferred way of handling Injustice 2 Mobile? Do you want a new app, an expansion for the old one or a completely new mobile experience? Tell us in the comments below. We will continue to follow this topic and update the article when new information becomes available. I’ve only been playing for a few months, but i can already say that because of the amount of time I alone put it, id much rather them just create an expansion to the original mobile game…. Just add 10 new pages of Single player battles or a new Story mode or something. Release all the new I2 Characters/Gears into this roster along with whatever other modes they want. But i don’t really see a real reason to have to create an entirely different game when they already have the platform along with the players here. Its not like a Console game where we have to go buy the new game to play…. We pay for everything IN game, so for them to have to create an entirely new game rather then release everything into this one just docent seem sensible to me. its an awesome feeling that injustice 2 can possibily come in next few months but its fair to those players who is playing these game for a long time.HOPE they will allow our old wibid to use in the battle……………………………………. I hope that it’s possible that we are able to transfer our old account into the new injustice 2 app. They’re two completely different games. Comparing Injustice Mobile to Injustice 2 Mobile is like comparing a hot country broad to a hot big city broad. Injustice Mobile is great in its MP seasons while I think Injusitce Mobile 2 will focus more on a story/RPG style of gameplay. Right now, I prefer Injustice Mobile 1.0 for its MP seasons. Even with the hackers it’s still fun. There’s a clunky look to the characters in Mobile 2. Not as smooth and they don’t really capture how the character’s powers influence his style of fighting. Reminds me too much of Marvel’s Contest of Chumpions, of which I abhore. It’ll take people awhile to learn all the ins and outs of a game that may have been over-engineered for use on a mobile device. In general, I think the mobile game shouldn’t be a mirror image of the console version because the mobile version is more for playing when you’re bored at a conference listening to someone who likes to hear themselves talk or playing at a funeral, during a wedding, at Christmas supper, a family reunion, your wedding anniversary, a birthday party or while blasting a dookie. I’m not iving up on it though. My advice to the developers, keep it as far away from Marvel’s Contest of Chumpions as possible.